An enlargeable relief map of Chile with major roads and rail lines depicted. Transantiago, Santiago's public bus system. Buses are now the main means of long distance transportation in Chile, following the decline of the rail network. The bus system covers the whole country, from Arica to Santiago (a 30-hour journey) and from Santiago to Punta Arenas (about 40 hours, with a change at Osorno). There are also international services to most other countries in South America. Longer-distance services are mostly on semi-cama (reclining seat) or cama (sleeper) buses, often double deck. Santiago began its public bus system Transantiago in 2007. 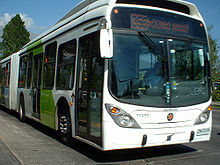 Concepción's "Bio Bus" integrates with the electric train, Biotren, and is based on a dedicated right of way for buses. Chile's railways (except for a few dedicated industrial lines  ) are operated by the state owned company Empresa de los Ferrocarriles del Estado (EFE), which completed a major investment programme in 2005. The rail system once served the entire country, running rail lines from Arica in the north to Puerto Montt in the south. Due partly to the nature of the terrain and evolution in transportation systems, rail travel has suffered greatly at the hands of bus and air competition. The train usually takes longer to reach a destination than a bus, and the comfort is comparable. Prices also tend to be uncompetitive. Rail freight transport has also suffered at the hands of the trucking industry and will continue to do so due to the immense leverage the truck driver's union can bring to bear if they were to feel threatened. The Ferrocarril de Antofagasta a Bolivia is a metre gauge railway in the north of the country. It was originally constructed in 2 ft 6 in (762 mm) gauge. The northern rail line out of Santiago is now disused past the intersection with the Valparaíso line. Until there it is used nearly exclusively for freight. Although the rest of the northern line is still in place, it is in a state of serious disrepair. The southern line runs as far as Puerto Montt and is electrified as far as the city of Temuco, from where diesel locomotives are used. Due to lack of budget and care, the 389 km Temuco to Puerto Montt section was abandoned in 1992 but after a $44m upgrade it has been back in use since 6 December 2005 with daily service between Victoria (north of Temuco) and Puerto Montt; today, however only the service between Victoria and Temuco still operates. Work to build/restore(?) the South Trans-Andean Railway link between Zapala, Argentina and Lonquimay, Chile was underway in 2005. Possible break-of-gauge. Possible rack railway. Construction was undertaken by Patagonia Ferrocanal SA, formed and funded by the province. The first 7 km was completed by January 2006. Commuter rail lines in Santiago are planned to connect to Melipilla and Batuco. There have been repeated case studies regarding the installation of a high speed line between the cities of Valparaíso and Santiago, some even considering maglev trains, but no serious action has ever been taken on the matter. Argentina - Central Trans-Andean Railway - abandoned 1984 – 100 km of mountain railway of 1,000 mm (3 ft 3 3⁄8 in) gauge with rack railway sections - break of gauge 1,676 mm (5 ft 6 in)/1,000 mm (3 ft 3 3⁄8 in) at either end. Concession planned to re-open line. Peru - yes - a single 1,435 mm (4 ft 8 1⁄2 in) gauge connection between the northern Chilean city of Arica and Tacna in Southern Peru. Arturo Merino Benitez International Airport, located in Santiago, is Chile's largest aviation facility. Chacao Channel bridge is a planned suspension bridge that was to link the island of Chiloé with mainland Chile crossing the Chacao Channel. It was one of the several projects that were planned to commemorate the Chile's bicentennial in 2010. If completed, it would have been the largest suspension bridge in South America. ^ Thomas Salt (2006-04-01). "Automation gets the most out of mining railway infrastructure". Railway Gazette International. ^ a b John Kolodziejski (2006-04-01). "Record investment boosts EFE's passenger business". Railway Gazette International. Archived from the original on 2012-05-31. ^ "Passengers return to Puerto Montt". Railway Gazette International. 2006-01-01. ^ "IIRSA" (PDF). Initiative For Regional Infrastructure Integration In South America. 2005-09-01. Archived from the original (PDF) on 2007-06-28. ^ "Work starts on trans-Andean link". Railway Gazette International. 2005-02-01. ^ "Finance". Railway Gazette International. 2006-01-01.